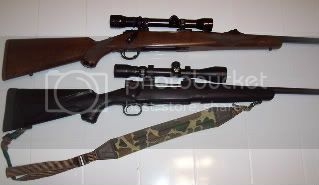 I just love looking at all the different guns and would love to get a new deer hunting rifle. And I have decided that I want at least one of each. I love you honey, if you are reading this. There’s just so many nice one’s to choose from. Why not just get one of each, that way you don’t have to make such a tough decision on which one is best for you. When you are shopping for deer rifles there are a few things to consider before making a decision on which one to buy. I have had my eye on a Remington Model 700 mountain rifle for quite some time. Even though just last year I bought a Winchester Model 70 7MM WSM that I absolutely love. I shot a nice 9 pointer with it and it did a great job. When I got my first deer hunting rifle at 13 years old, I used a Marlin 30-30 lever action that my mother gave me. I’m sure she probably got a good deal, she worked at a gun store. I took a lot of deer with that rifle. I bet there have been as many deer taken with a 30-30 as just about any other rifle. One of the things you should consider is what type of terrain you will be hunting. Will it be thick brush country, or wide open terrain, or a combination of both , or something else. I found another great article on calibers for deer. You can check them out and decide which one is best suited for the type of hunting you will be doing. If you are going to be doing a lot of walking you want to consider a light weight deer hunting rifle. I have Ruger M77 300 WIN Mag and I don’t like carrying that thing to far, it is heavy. But it sure will do the job on a big whitetail. They don’t go far when you hit them with it. Also, you want to decide if you want a bolt action, auto loading, or lever action. Each one has its own special qualities. You can see a great article on each here, bolt actions, lever actions, auto loading deer rifles. Once you do some research you can go to a gun store and check out different ones and compare prices and see which one fits your needs, and budget. No matter which one you choose to get, I think it is our responsibility as hunters to practice with it, and sight it in properly, in order to make a good shot and harvest the animal as quickly and humanely possible. Also I think that it’s not so much the caliber that matters(maybe at certain distances) but shot placement is critical. I think maybe I contradicted myself, because without the correct caliber, shot placement would be difficult. I hope this article and the links in it, will be helpful to you , when shopping for a deer rifle. Tagged deer hunting rifle. Bookmark the permalink.